1. Is there a RSS feed of new Wii games? I looked around Amazon and maybe there’s a feed for this new and future Wii releases page but it doesn’t seem to be sorted by release date. Is there something better out there? 2. The News channel has a great interface that also reminds me of Pointcast. This is stupid, but I love the wacky text resizer. Has anyone recreated it in js for the web? The text resizer is awesome. I believe that this particle zooming functionality is built into the WiiOS itself… doesn’t the photo channel do the same thing with resizing of photo thumbnails? 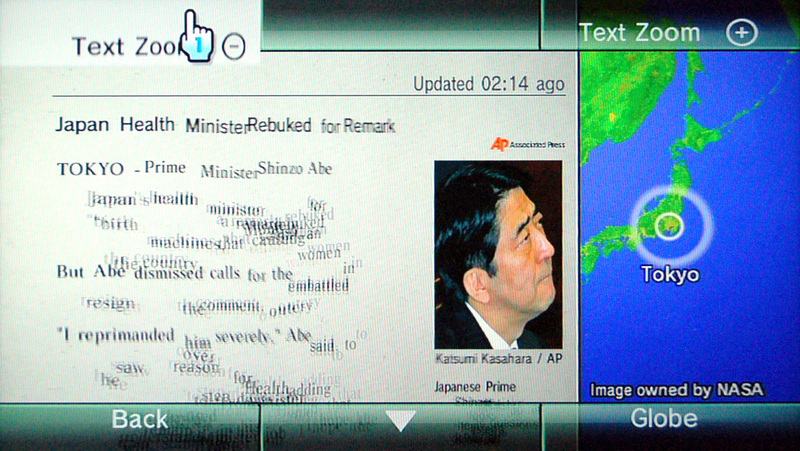 I love zooming Wii news stories. So cool. I also remember someone was running a Wii-mail list where you would add their email address to your Wii and that would subscribe you to emails with new VC games. Unfortunately I can’t find it on Google and don’t want to go through all the late-Nov / early-Dec posts on Digg looking for it.